Many of you have asked about practicing your note reading skills at home! 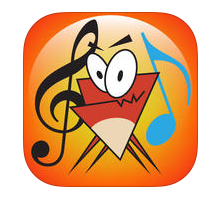 This is a free app that you can download for iPad or iPhone or iPod so that you can practice at home! It's called NOTE WORKS! Be sure that your thumb is in the correct position when you hold your clarinet under the thumb rest. The thumb rest should touch the edge of your thumb nail. This helps to create proper finger position for your front fingers when we play using the bottom hand! To B Flat or To B Natural! That is the question! B flat and B natural are often confused on the clarinet. 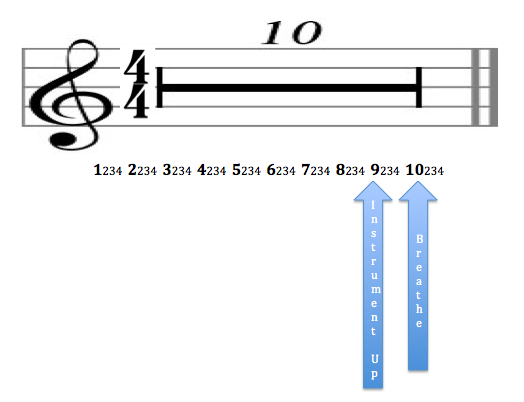 An easy way to remember which one is which is to think: B Flat- First Finger! FLAT and FIRST both start with F! When you have multiple measures of rest in a row, it's easy to get lost and miss your next entrance! You can write in the counting for your rest like I have done here on the left. As a general rule, you should start putting your instrument up on the second to last measure of your counting. By the last measure of your counting your instrument should be in your mouth or at your lips and you should begin taking the breath for your next entrance! You hand position is very important when playing clarinet. We always want to think about having round, curved fingers. Imagine that you are holding a can of soda between your fingers and thumb and look at how the shape of your fingers/hand. This is how your fingers should be curved when you hold and play your clarinet. The picture on the left shows straight fingers which we want to avoid. 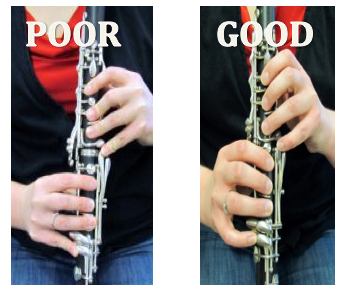 The picture on the right shows nice, curved fingers which are ideal for clarinet playing! When you are using your fingers to push cover the holes on your clarinet, be sure that you are using the very tips of your fingers! You should be using the chubby part of your finger tip so that is seals up the hole. This will keep the air from escaping where your fingers are and help you to produce a clearer sound. Beginners and students who seem to forget- Watch this video for a handy song to help you remember your lines and spaces of the treble clef! When you practice at home, don't just play through your music from beginning to end. Use this process and it will help you to review concepts that we have practiced in class. It's easy! 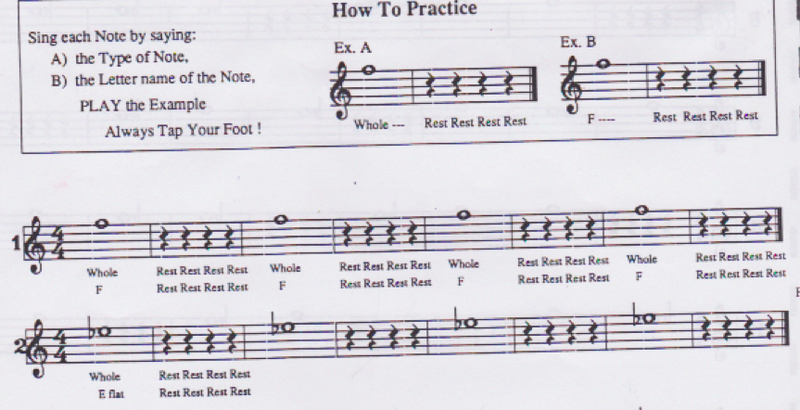 1) Sing each note type (whole, half, quarter, etc) for it's correct number of beats for the whole exercise. 2) Sing the letter name of the note (ABCDEFG) with the correct rhythm. 3) Sing the letter name of the note while doing just the fingerings. When we breathe to play our instruments, we want to make sure that we are taking nice deep breaths into our lungs. Practice taking a deep breath. If your shoulders are moving up towards your ears, you are not breathing fully! Put your hands on your belly. When you breathe in, your belly should expand and push outwards. When you breathe out, your belly should contract or move back in. When we play music, we want the beats to be played to a nice steady beat. If we don't all keep the same steady beat, it is hard for us to stay together. 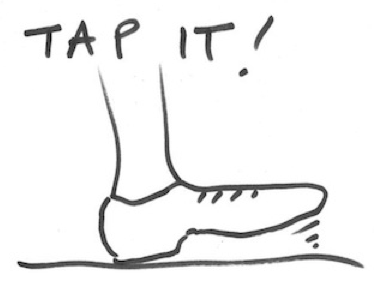 Tap your toe while you practice your instrument at home and whenever you play at school. You can even just practice tapping a steady beat to your favorite song on the radio! Remember that you should wet your reed before you put it on the mouthpiece! The reed should be centered on the mouthpiece and only a small part of the black should show above it! When you put the ligature on, remember that it should rest right under the "smiley face" of the reed and then tighten the screws! If your ligature is silver, the screws should be closest to you and if it is a black ligature, the screw side should face away from you!